I am pleased to announce that after a long recovery from rotator cuff repair, I will be returning to teaching yoga at Sangha Yoga Collective on September 18. On many levels, my injury has been my teacher. I hope to bring to you an enhanced knowledge of shoulder alignment, and an appreciation of the tools yoga may afford for dealing with life’s little surprises. I am trying something new this fall, a one-hour noontime class I’m calling “Noontime Nourish,” for nine Thursdays beginning September 25, with a free preview on the 18th. The idea is that we’d practice some yoga at noon, and then whoever was available could hang around with a brown bag lunch to talk about yoga philosophy, Ayurveda, or conscious eating. Personally, I always find Thursdays to be the most difficult day of the week to get through. It has all of the stress of Friday with none of the relief of looking forward to the weekend. What a great day to offer respite in the middle of the day. 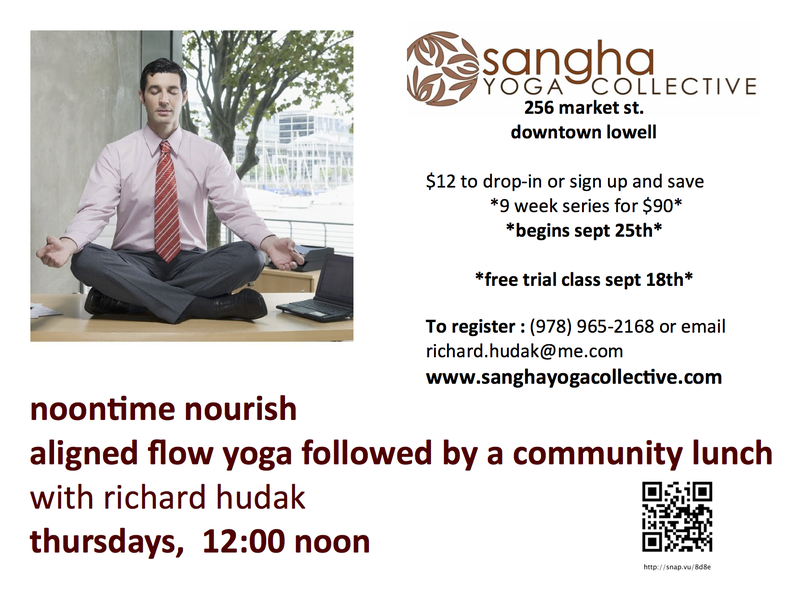 For all the details please see this lovely postcard provided courtesy Sangha: Noontime Nourish Postcard. Also, sign up for my mailing list.